Whether they’re planning for Thanksgiving or not, MoFoers are cooking up some amazing things, with less than a week left. Megan, from Down Home Vegan makes a lovely Vegan Salad Niçoise with marinated seitan. At Vegan Gourmet Caravan there is an amazingly beautiful Orange Dragonfruit Ice Cream. Noelle at An Opera Singer in the Kitchen whips up some tasty Tropical Persimmon Muffins with Coconut Spice Creme. The Ceci with Garlic and Sage over at C’est La Vegan has me drooling, and would make a great appetizer for Thankgsiving, or any time of the year. 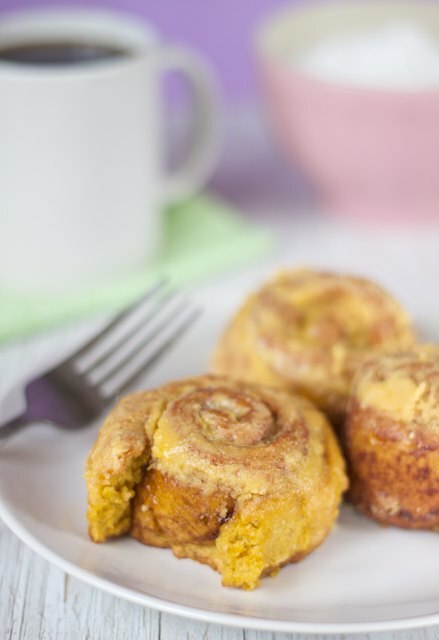 Allyson at Manifest Vegan makes some perfectly fluffy Gluten and Soy-Free Pumpkin Cinnamon Rolls. Vegangela makes a different kind of risotto using cauliflower instead of rice, while Tofu Mom at Tofu N Sprouts wows us with Pumpkin Polenta with Pumpkin Seed Sage Pesto. Vegan Epicurean bakes up a sweet and spicy Tamarind, Orange, and Cayenne Baked Tofu, and I would love a slice of this Chocolate Chestnut Tart from the New Vegan Table. That’s it for the last Wednesday of Vegan MoFo 2011. Have a safe and happy rest of the week, whether you’re celebrating a holiday, or enjoying delicious meals just because! THANKS for the include, I’m honored to be mentioned amongst all this ridiculously good food. I’ve bookmarked pretty much everything from today’s post. Yay! Thanks for the shout out! It all looks so GOOOD!